One month ago me and my two fellow interns arrived in Chicago and started our work here at the Consulate-General of the Netherlands. The focus of my specific project is to look into the opportunities that may exist and connections we could make for Dutch biobased business in the Midwest of the USA. To many people, the word ‘biobased’ is associated with the circular economy. Indeed, there is a relationship between these two concepts and they can certainly strengthen each other. Both concepts have the aim of minimizing negative externalities, but they are complementary rather than interchangeable. The biobased economy also has the vision of closing the loop, but wants to do so by the production of renewable biological resources and the conversion of these resources and waste streams into value added products. Doing biobased business must be part of the discussions on and strategic plans towards the circular economy as it brings the renewability aspect into the cycle. This moves us beyond recycling and reuse of waste. 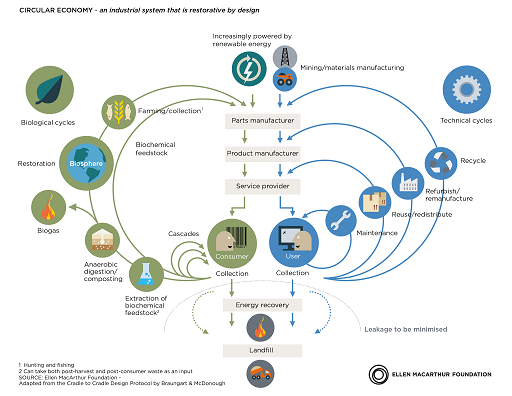 The Circular Economy System Diagram from the Ellen MacArthur Foundation is a visual representation of this duality. The system shows two cycles: the biological cycle (biodegradation) and the technical cycle (share, maintain, reuse, remanufacture, recycle). However, the differentiation of these two cycles can be misleading as many biobased products are non-biodegradable and therefore do not enter the biological cycle. They will enter the technical cycle, for instance non-biodegradable biobased plastics like PEF. We need to have an integral approach towards the biobased and circular economy as only by integrating the two we can really minimize the negative externalities of consumerism. A crucial aspect of the biobased economy is the so-called cascading of biomass. This concept entails using the biomass for the application that creates most added value. In this way all components of biomass, separated through biorefinery technologies, are used most effectively. The highest value application is determined according to the Biomass Valorization Pyramid. Currently the largest new market is biomass for energy (heat and electricity), and fuels like ethanol and biodiesel. However, as solar and wind energy become cheaper, biomass is likely to move up the ladder towards industrial heat (high temperature), long distance transport (jet fuel) and biobased chemicals and products. To narrow down the scope of my project for upcoming months, and to avoid the discussion on whether the combustion of biomass is indeed sustainable, I will focus on the expected growth markets: fuels, and biobased products and materials. When I visited the Dutch Ministry of Economic Affairs and asked about how the biobased economy became a topic of interest for the first time, I was surprised. It appears biobased economy first gained attention during the eighties when there was a large surplus of agricultural products. First thoughts back then were: what else can we do with these surpluses except for using it for food or feed? This means that originally, doing biobased business stood in the spotlight out of abundance rather than out of scarcity. I find this interesting as we now see the biobased economy as (one of) the ways we can create a more sustainable society and deal with our finite resources. A few decades down the road we can now see a change in the approach of the government. After the foundation of the TKI-BBE, a cooperation of the top sectors Chemistry, Energy and Agri&Food, the central government has shifted its attention slightly towards the circular economy. Although the biobased economy is still part of this strategy for a circular economy, priorities have somewhat shifted. This does not mean that developments towards a biobased economy have stagnated. Not at all actually. The governance of biobased business is now mainly done by the EU at the European level and by regional development agencies at a regional level. They do this in cooperation with various stakeholders from research and industry. Exemplary is the foundation Biobased Delta which unites the Western part of Noord-Brabant, Zeeland and Zuid-Holland in a cluster that has ambitions to become one of the leading clusters in the biobased economy. The Sugar Delta is one of their programs, aiming to enable the construction of a biorefinery plant in the southwest Netherlands that can produce green chemical products and ingredients from sugar or starch. With the abolishment of the EU sugar quota in 2017, sugar has a lot of potential as a feedstock for green chemical industry. So, what are we good at? The Netherlands has developed expertise in the chemicals, materials and energy industries. Technological innovations are developed and brought to the market by corporations such as DSM, Avantium and Corbion. Research institutes like Wageningen Food & biobased Research and Delft University of Technology have a strong knowledge base in this area and are known worldwide for their expertise. The technologies concerning biorefinery processes and material development have a lot of potential to cross the borders and we should look into opportunities to capitalize on this knowledge base. In addition, Dutch industry and government are strong in collaborating both along vertical value chains as well as across industries. The TKI-BBE initiative is a great example as it brings together the critical sectors required for doing biobased business: Chemistry, Energy, and Agri&Food. It is just one of the several platforms and collaboration initiatives that exist on the national and European levels. An important EU initiative is the Bio-based Industries Consortium that intends to bring initiatives to the market. This consortium has a budget of € 3.7 billion and Dutch companies and universities are quite involved in the organization. These industry initiatives can help solve an issue that remains persistent: the upscaling and commercialization of pilot projects. There are both technological and financial challenges in upscaling projects. Particularly if market demand has not yet ‘sparked’. Finding (brand) partners downstream in the value chain that guarantee sales can mitigate these uncertainties. One of the industry examples for collaboration across the value chain is the consortium in which, among others, Coca-Cola and DANONE participate. This consortium has jointly invested in the so-called YXY technology enabling next generation plant-based plastics. This technology was originally developed by Avantium and is now brought to market together with BASF in their joint venture Synvina. The last couple of weeks I have already experienced the biobased economy to be a highly complex market that has many external (geopolitical) factors influencing its developments. I have spoken to a lot of passionate people in the Netherlands which makes me believe that doing biobased business is indeed taking off, though maybe somewhat slower than hoped for. It can be difficult at times to find the perfect product-market combination, but there are definitely some gems out there. The key to all this, as it is often, is collaboration. The upcoming weeks I will continue to explore the US market, and specifically the Midwest, the focus area of the Consulate-General in Chicago. The Midwest is known for its agricultural heritage and producing vast amounts of biomass. The area has some unique advantages over well-known hubs like Silicon Valley and New York. The Midwest has the same ‘down to earth’ business culture as the Netherlands and it has the highest concentration of Fortune 500 companies and large corporations in the US. Chicago specifically is ideal for companies that focus on B2B and cut across sectors as no industry represents more than 14 percent of the economy. Factors that are indeed relevant for doing biobased business as it requires expertise on industries like agriculture, chemistry, energy and manufacturing. The availability of biomass, the knowledge on agriculture and biotechnology combined with relatively low costs of doing business could provide openings for Dutch industry. This article is based on discussions with: Hans Langeveld (Federatie Bio-Economie Nederland), Peter Besseling (Dutch Ministry of Economic Affairs), Jacco van Haveren (Wageningen Food & Biobased Research), Willemijn Witteveen (Avantium), Ward Mosmuller (DSM), Diederik van der Hoeven (Biobased Press), Hans Keuken (Process Design Center), Kees Kwant (RVO) and Marcel van Berkel (VanBerkel Consultancy BVBA). Source: Bio Based Press, 2018-04-15.